Not only did alternative-propulsion vehicles take over the show floor, discussion of the various types, from compressed natural gas (CNG) to hybrids and propane to electric, made a major impact on attendees at the 18th installment of BusCon, held in Chicago’s Navy Pier in September. The exhibit space showcased products from more than 145 exhibitors and touted 64 vehicles, including an unprecedented four electric vehicles, in a range of sizes. Electric vehicles made a major showing on the floor, with four companies showcasing products. Making its debut to the market at BusCon was Phoenix Motorcars’ 14-passenger Phoenix Electric Shuttle, which is available in multiple configurations and fully customizable. 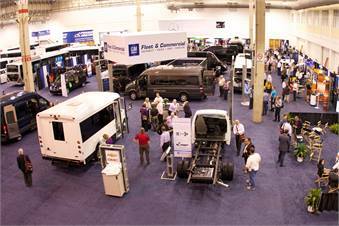 All of the electric vehicles, including Proterra's, created significant buzz on the show floor. Proterra showcased its EcoRide BE35 transit bus, which it calls the world’s first battery-electric bus with fast charge-enabled infinite range. Hennessy added that Proterra has 18 of its vehicles in revenue service at six different transit properties and expects to have 40 vehicles on the ground by the end of the year. The vehicle on display at BusCon was launching a two-week demo tour at transit agencies around the nation. 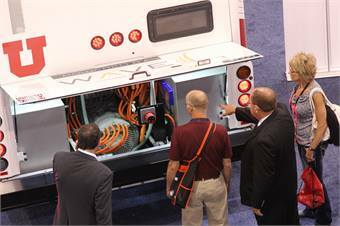 Showgoers take an up-close look at CCW's electric bus offering. Complete Coach Works (CCW) featured a 40-foot all-electric bus it built for the Utah Transit Authority, using WAVE (wireless advanced vehicle electrification) technology. The wireless system works when one charging pad is attached to the bottom of an electric bus and another is planted in the road at a key point along the transit route. After the bus stops over the pad in the road, the induction charge sends power to the battery via a wireless transfer that can travel across several inches of airspace. A few minutes later — depending on the size of the battery — the bus is ready to resume its route. China’s BYD Motors Inc. showcased its 40-foot offering, featuring a range of 155-plus-miles per charge, meeting roughly 80% of large city transit average daily service routes. It features BYD’s iron-phosphate batteries that can be recycled and repurposed for utility energy storage. BYD expects to deliver the first of 10 buses to Calif.-based Long Beach Transit in March 2014, followed by 25 more for the Los Angeles County Metropolitan Transportation Authority, which will all be built at its plant in Lancaster, Calif.
Riley added BYD also expects to introduce a 26-foot vehicle, a 60-foot articulated model and a 45-foot tag-axle over-the-road coach all between 2014 and the end of 2015. Elsewhere on the show floor, Ameritrans unveiled its R330 Series, built exclusively on the Ram 5500 SLT chassis, with a Cummins ISB engine and Aisin six-speed transmission, while Meridian Specialty Vehicles offered two 14-to-20 passenger vehicles built on the 24-foot Mercedes Benz and Freightliner Sprinter chassis. The company recently announced its product line will expand to include shuttle and paratransit buses. Winnebago, making its BusCon debut, introduced three new Metro Link models to the market, including public transit and airport versions and a CNG version, which may be used as a shuttle or airport shuttle. Metro Link’s design and features are specifically tailored to provide a better functioning vehicle with reduced maintenance and improved durability. 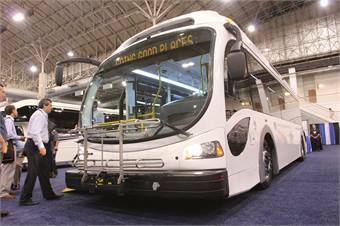 Additional vehicle and market debuts included offerings from Goshen Coach, ElDorado National, Supreme Corp., Collins Bus Corp. and Champion Bus. Q’Straint showcased its Q’UBE 3-Point Securement Station, which features a sliding bumper that provides critical stabilization and tip-over prevention that the ADA requires for three-point securement. It was designed for transit operators that need to maintain maximum passenger seating capacities in two-plus-two seating layouts. Meanwhile, Freightliner Custom Chassis Corp. unveiled two new products: the 23,000-lb. X-Ride commercial bus suspension and the newest version of the S2C commercial bus chassis. RELATED: "BusCon 2013 Products Showcase."